Last weekend, Jordan and I cooked a special dinner together. It was our standard birthday/anniversary/Valentine’s day meal—a beautiful steak, buttery potatoes, a good bottle of wine. We have it just a few time a year and it’s wonderful every time. I remember the steak dinner that started this tradition, I think it was our third anniversary. Jordan cooked at his parents’ house. I was on break from college. He made steak au poivre, roasted fingerling potatoes, beet salad and a dark chocolate souffle. I still have the menu he typed up for the occasion. (Can we just pause for a second an appreciate that he typed a menu for the occasion, adorable.) The meal has been a constant of our relationship ever since. Now that a few years have passed, we’ve worked out all the kinks. Jordan handles the steak, usually simply grilled and finished with butter. I make the sides and dessert. 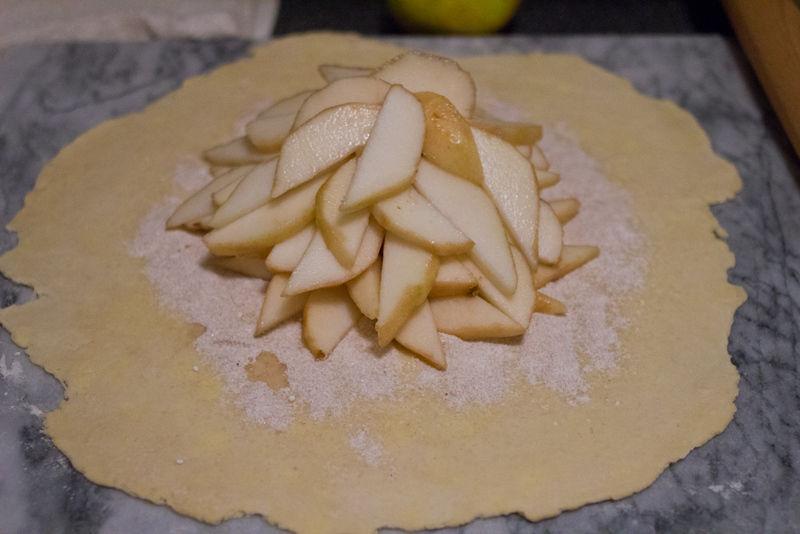 Dessert is the only part of the menu that changes and this weekend I decided to make a pear galette. So it was Saturday afternoon and I was standing in my kitchen making the galette. Now, those of of you who know me well, know that the type of experience I’m about to tell you about doesn’t really happen to me. I’m pretty solidly grounded, and frankly, if this happened to you and you told me about it, I’d probably think it was a little new-agey and nuts. 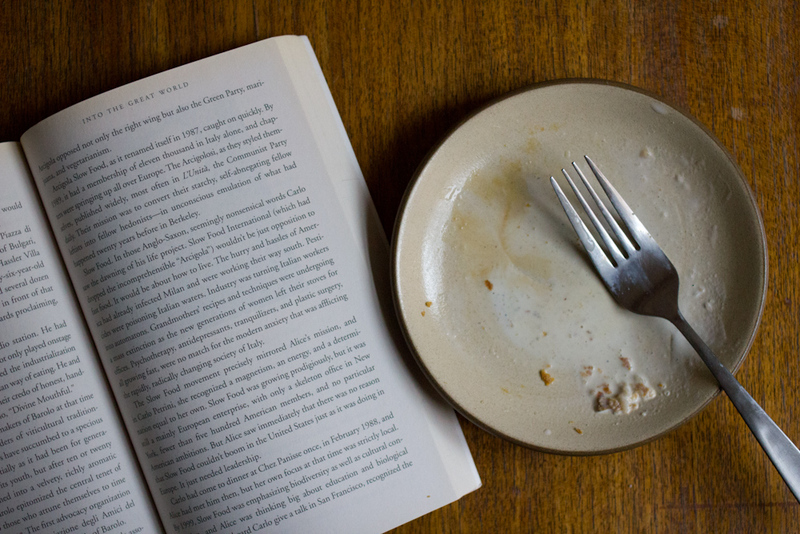 Now putting all that aside, as I stood there slicing the pears for my galette, I was transported. For just a few minutes, I felt like the person I’m meant to become. She was calm and confident and capable. 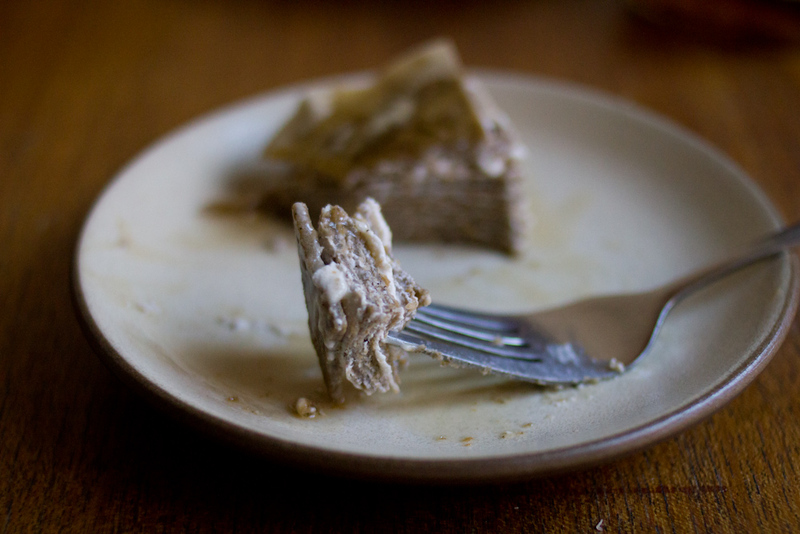 I folded the dough up around the pears and I knew in this very concrete way that everything is going to be alright. It’s been an especially anxious year, full of lots of worrying on my part about big things and small (but mostly big, if we’re honest). And so it was such a relief to just know that everything is going to be ok, that I’m going to be ok. Knowing that this happier, calmer version of myself is out there and that I’ll get there some day—even if it isn’t today or tomorrow or this year—put me at peace in a way nothing else has. I’ve tried to reason myself into feeling this way for months, but it took this unexpected, out of body experience to actually get the message across. 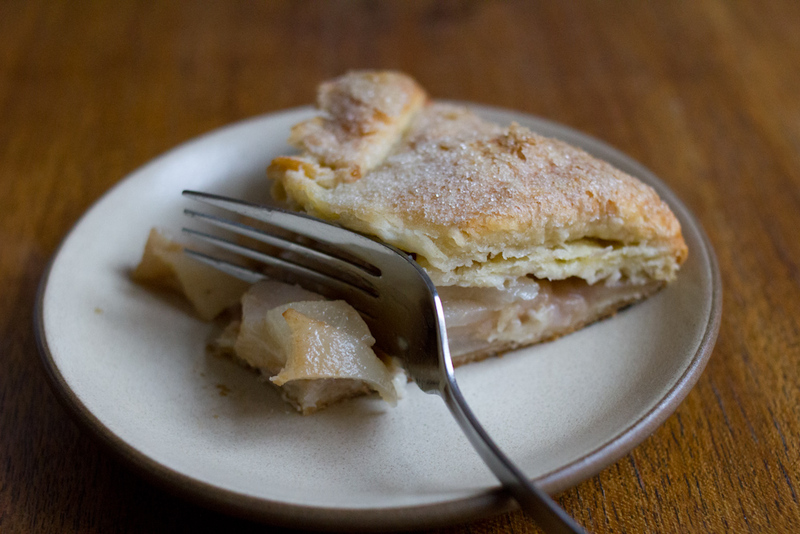 Strangely, or maybe not so strangely, I have a pear galette to thank for that. 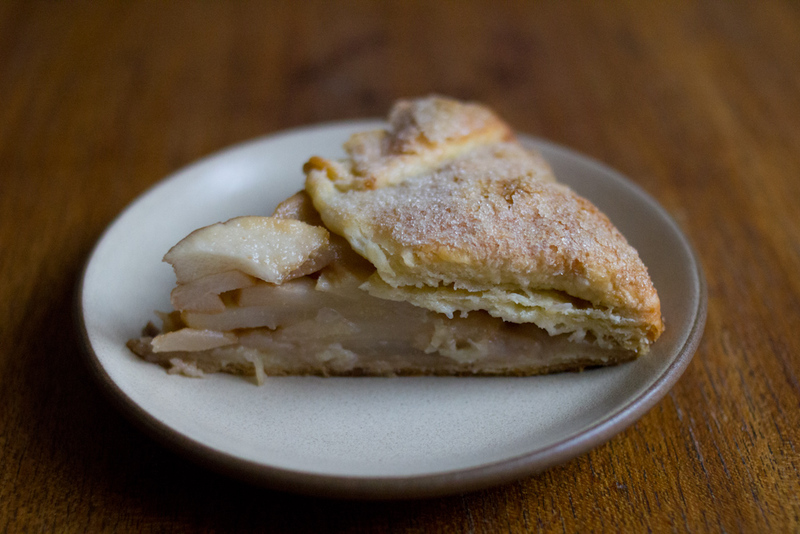 As for the pear galette, it was divine. 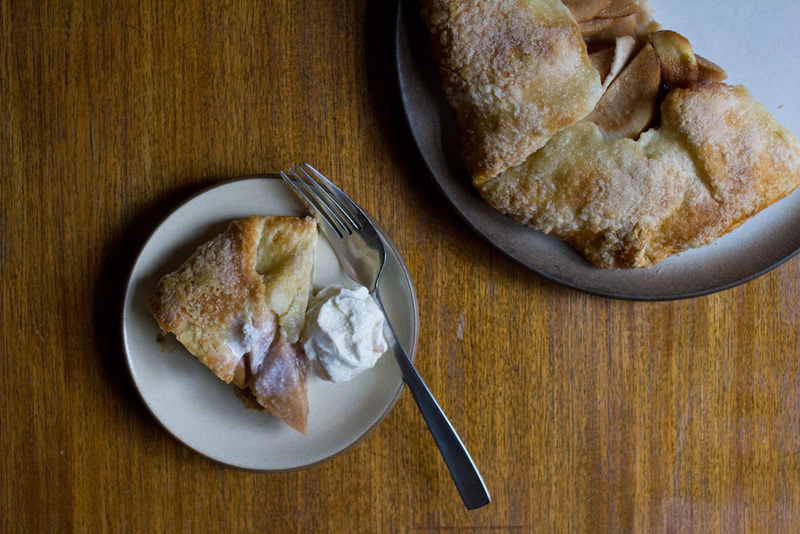 Comice pears are perfect for pie—the texture can stand up to baking and they don’t get too sweet. 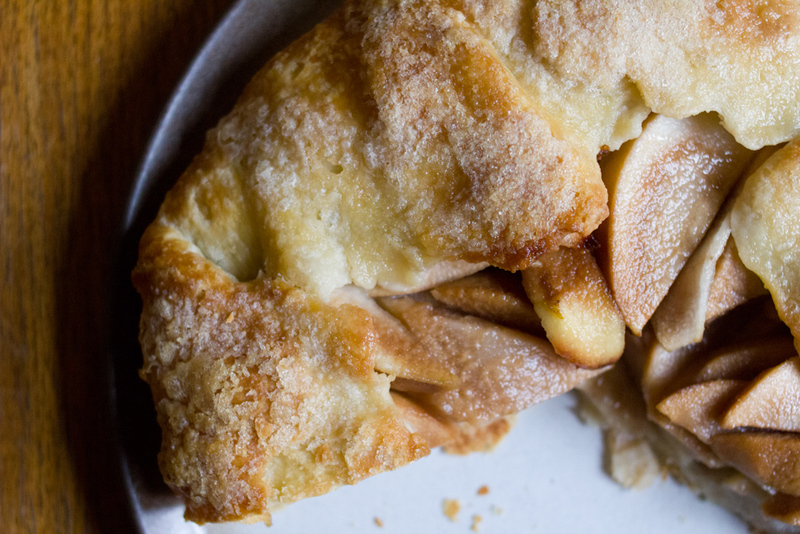 The galette has just enough spice to accent the flavor of the pear, but doesn’t overpower it. 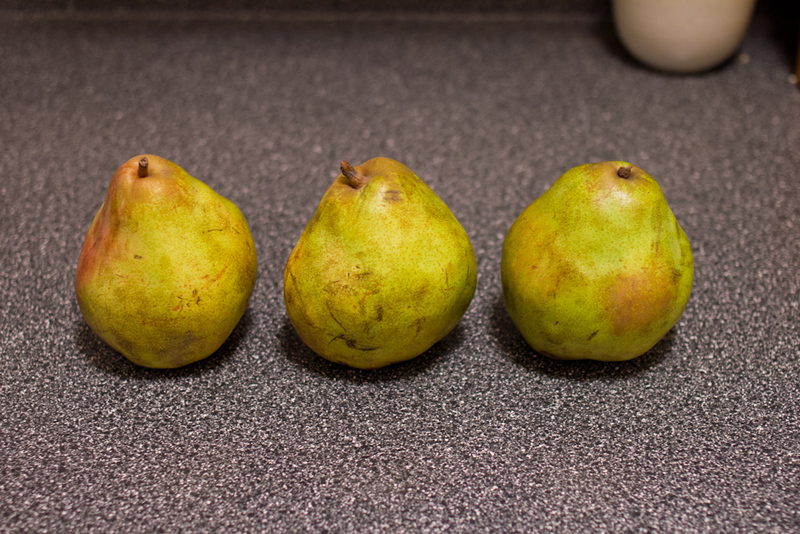 I’d recommend you hurry and make your own before comice pears are done for the season. In a food processor, combine flour and salt. Remove the butter from the fridge and cut into 1 inch cubes. Add them to the flour mixture. Process until the butter chunks are about the size of peas. Add the water and pulse a few times to combine. Divide into two equal balls, flatten into 1″ thick discs, wrap in plastic wrap and refrigerate for at least two hours or overnight. Preheat your oven to 400° F. Line a baking sheet with parchment paper. Peel the pears and slice them into thin slices. In a small bowl, combine the flour, sugar and spices. Dust a surface with flour and roll out the dough until it is about 1/4 inch thick. In the center of the dough, sprinkle the flour mixture. Arrange the pear slices in a mound on top of the flour mixture. Fold the dough up around the filling. Brush the dough with water and sprinkle with a heavy dusting of sugar. Transfer to a parchment-lined baking sheet and back for 40 minutes to 1 hour, until browned and bubbly in the center. You can also form the galette, cover in plastic wrap and return it to the fridge until you want to bake it. I like to serve mine warm with ice cream and usually put it into the oven as we’re sitting down to dinner. It’s also really good for breakfast. Just say you need to take a good photo for your blog. Enjoy! My mom used to make red beans and rice for us as kids. It was the only holdover from the time she and my dad spent living in New Orleans while he was in medical school. And we were obsessed. It’s probably still my favorite dish that she makes. Now, whenever the kids are coming home, she’ll throw a batch in the crockpot and we’ll feast when we arrive. That drive from San Francisco to Sacramento, whew, you can really work up an appetite. I wasn’t planning to to make my mom’s red beans and rice this time around. 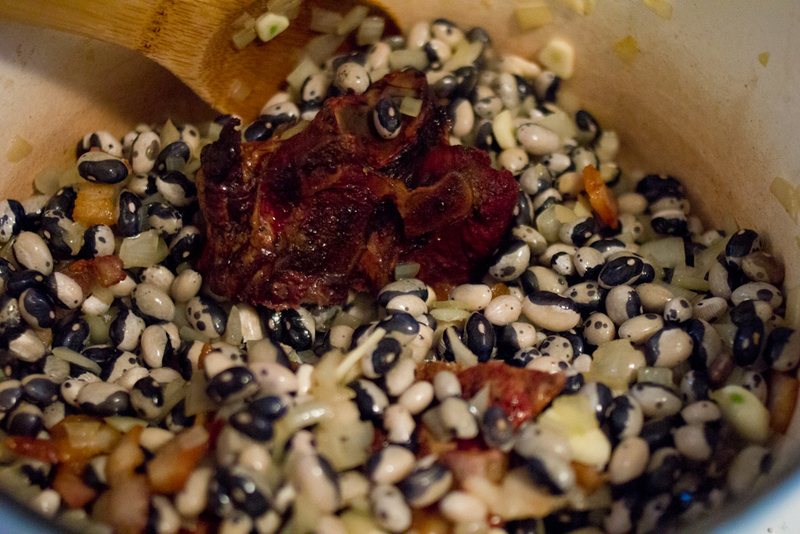 I’d actually found a recipe in David Tanis’ beautiful book The Heart of the Artichoke for an Italian-ish black eyed pea stew and that was more or less what I was working towards. 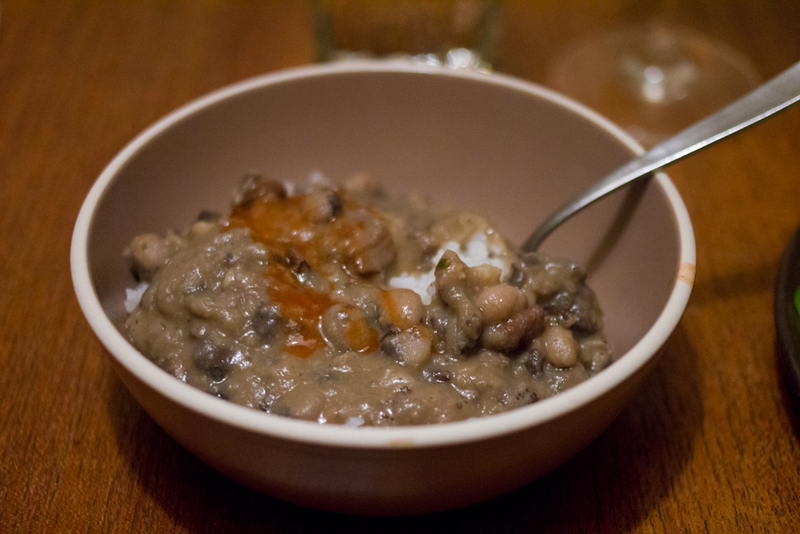 But one taste of those beans after they’d been simmering with a pork neck bone for a few hours and I knew a New Orleans infusion was in order. It was a good call, it’s probably always a good call. 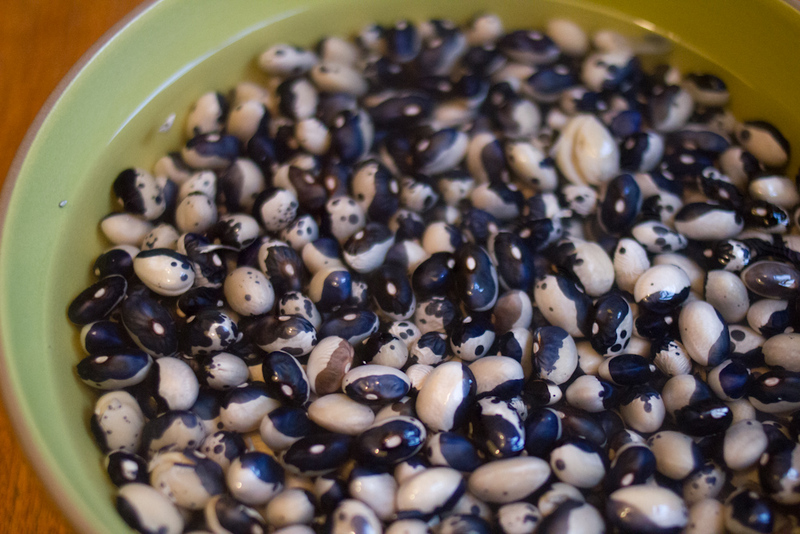 Maybe beans just shouldn’t exist outside of red beans and rice … or cassoulet … or burritos … or baked beans … hummm. Anyway, if you want a taste of my childhood, here it is. Soak the beans in a large bowl of water for 8 hours or overnight. In a large, heavy bottomed pan or dutch oven over medium-low heat, sauté the bacon pieces until they render their fat and begin to brown. Remove the bacon with a slotted spoon and set aside. If your bacon is fatty, you should have enough oil to sauté the onion in, but it it isn’t add a bit of olive oil or duck fat (when you live in this house you have a jar of duck fat in the fridge so why not make good use of it?) to the pan. Add the onion to the pan. Sauté for 5 – 10 minutes, until the onions are translucent. Likely they’ll pick up some of the more browned bacony bits left behind in the pot. That’s good news. Add the garlic and sauté another minute more. Add the beans, bay leaf and 6 cups of water. Be sure to throw in your ham hock at this point also. We had some delicious smoked pork neck bones from a pig my mom bought over the summer from a customer of hers, and so I threw those in instead. You could skip the smokey meat bit, but I wouldn’t recommend it—it adds a tremendous depth of flavor to what’s an otherwise pretty bland food. Turn the heat to low and let your beans simmer away, until they are tender. Mine took about 2 – 2.5 hours. After your beans are sufficiently tender, add the worcestershire sauce, cayenne, and thyme. Season with salt and pepper. Add the hot sauce to taste. About half of my beans were falling apart into a beany puree as I stirred. Depending on the texture of your beans, you might want to puree about a third of the mixture and add it back in if they don’t seem to be falling apart into mush on their own. It’s best to have some beans that are more whole and some that become more of a bean sauce. If you’re using a ham hock, you’ll probably want to pull that out and pick off the meat and throw the meat back in. This might happen on it’s own, but discovering a little hammy nublet when you’re thinking it’s just beans, that’s good stuff. Serve on a bed of rice with more hot sauce on the side. My mom will usually sauté up a few andouille sausages, slice them and top the beans and rice with them. You could do so too if you felt inclined. Bon appetit! PS. I’ve never been to New Orleans so I can’t honestly say how authentic my mom’s red beans and rice are, but I can guarantee that they are delicious. Her recipe is probably some California-Louisiana fusion that real purists couldn’t possibly endorse, but for me it will always taste like home. Sometimes, when you’re feeling particularly overwhelmed by the challenges the universe has decided to throw your way, there’s really not much you can do but bake a cake. I won’t elaborate on the details because these types of details aren’t fun for anyone, but I trust you’ve all been to a similar place. A place where there is nothing you can do but put one foot in front of the other, and bake a cake. Fortunately, I’ve got a slew of cakes for the baking. There’s Jordan’s favorite chocolate cake, there’s a perfectly citrusy loaf cake, there’s my Nonnie’s carrot cake, and now there is this cake. 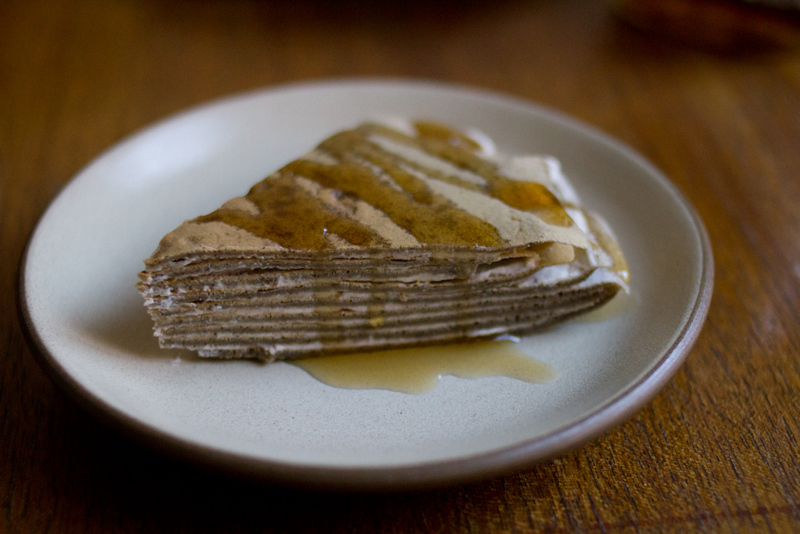 A cake made of crepes. 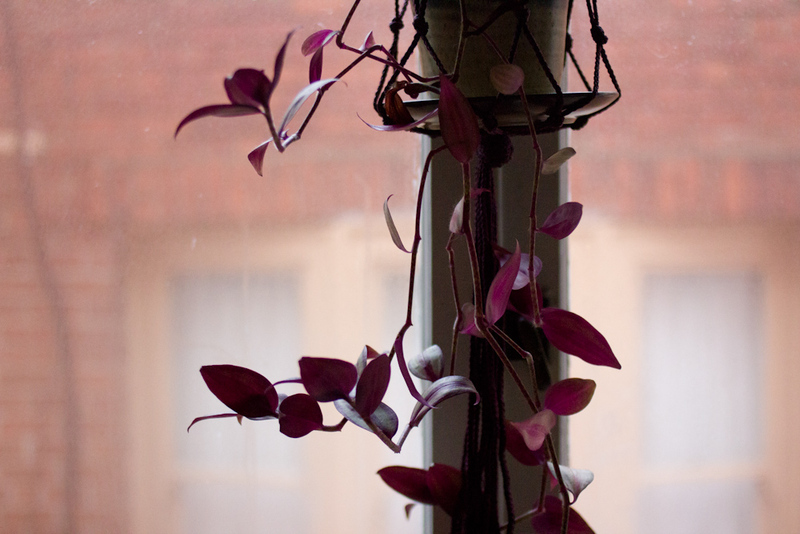 Mostly it just looks pretty, but let’s not discount how a pretty thing can lift the spirit. Whisk together the flours, eggs, milk, salt, sugar and vanilla. Let the batter sit in the fridge for 2 hours or overnight. Once the batter has rested, heat a nonstick sauté pan over medium-low heat. When the pan is hot, pour in about 1/4 cup of batter. Swirl the batter around the pan by tilting the pan, first to the right, then towards the back, then to the left, then to the front. Let the crepe just hang out there for a few minutes, don’t poke at it, don’t try and peak—both of these will result in a sad, probably ripped, subpar crepe. Be strong, resist the temptation. When the batter has formed thin skin and there are bubbles throughout, use a spatula to coax up the edges. Then, using your fingers or a spatula, flip the crepe. Let it cook another 30 seconds or so and repeat with the rest of the batter. Cool the crepes before assembling the cake. In a large bowl or the bowl of a mixer, combine the cream, cinnamon, nutmeg, powdered sugar, salt and vanilla. Whisk until a fluffy cream forms. 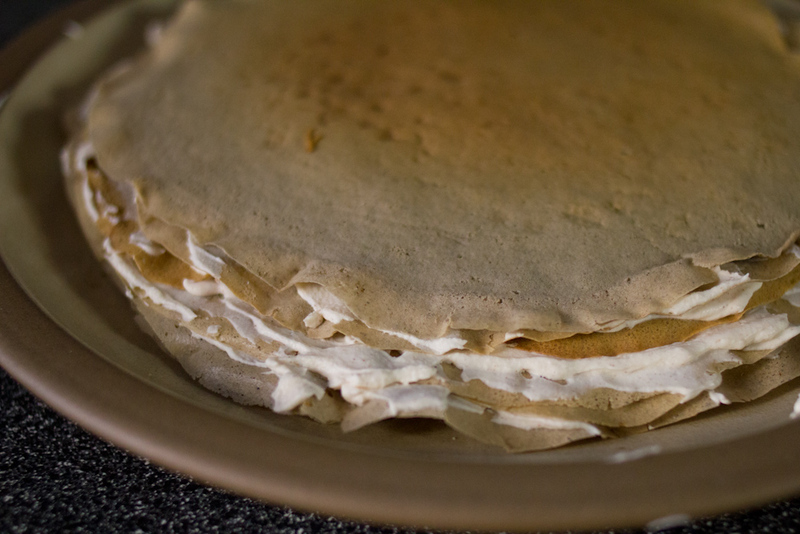 To assemble the cake, put a crepe on a large plate. 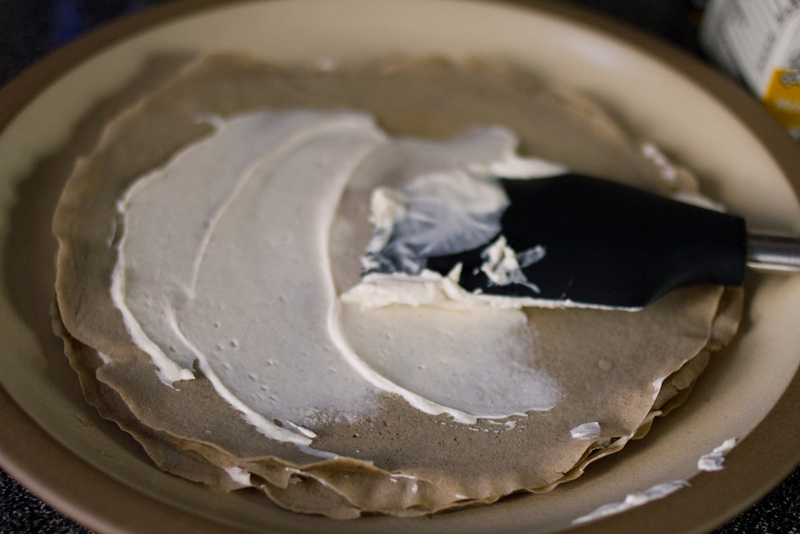 Spread a thin layer of cream and top with another crepe. Repeat until you’ve used all of the filling and all of the crepes. 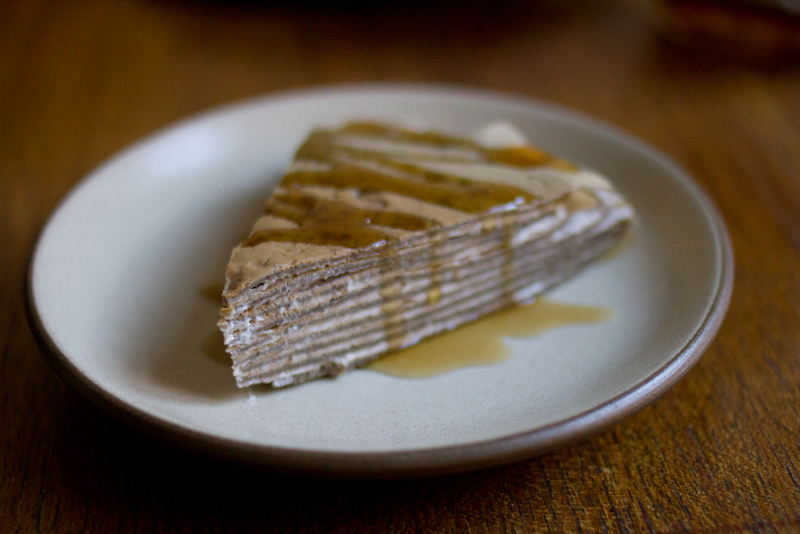 To serve, cut into slices and drizzle with maple syrup. It’s good for dessert. It’s even better for breakfast the next day. Dessert for breakfast isn’t to be discounted either.